Super Hero Boy: Pizza and board games? Count me in! Pizza and board games? Count me in! Poppa's Pizza Pile-Up from International Playthings has to be hands down the cutest game we have reviewed to date. A super chubby Italian baker holds up a pizza crust which then players must stack toppings on without knocking everything over. Depending on the difficulty level you can play with Poppa on or off his "feet" or base which without using the feet causes him to be very wobbly. Players roll a dice that shows the type of topping they must stack. No reading or math is required so its a great game for players of all ages. Since our munchkin is at the very bottom of the age range we opted to play the game turn based without the dice and just put one topping on each. Though older children will really appreciate the added challenge of using the topping dice. The player who lasts the longest without knocking off the topping wins. Though I absolutely recommend this game for all ages I found it to be almost a bit too challenging as the toppings have a tenancy to slide off a bit too easy especially for the little ones who may drop their toppings a bit too roughly. A small solution I found to that is to make a little cardboard circle to rest the crust on to give it a little more stability for the younger players. Older players and adults will really appreciate the fact that it really does make you really think about where you place those toppings. The whole game play, though very simple, can be as challenging or easy as you like and can be tailored to your players. Rated for ages 4+ and certainly easy enough to understand for even younger players I'd say this game is best suited for school aged children only from a motor skills standpoint as placing the pieces takes a steady hand. On a side note, Connor also enjoys just playing with the pizza crust and the toppings as a play food item once we are done playing as well. heh. 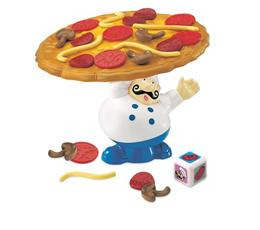 You can buy your own Poppa's Pizza Pile-Up from International Playthings directly on their website! While your over there check out all the great games available from International Playthings as well!